It’s been a long time since American television was purely live but it’s still an everyday part of broadcasting. Amidst the cycle of breakfast shows, daytime chat shows, primetime entertainment and 24-hour rolling news and shopping, there doesn’t seem to be an hour of the day that there isn’t some kind of live TV on the air. We know from experience that live broadcasting can be one of the most powerful, significant and thrilling forms of TV. Live television has been agent and witness to cataclysmic political changes. It made and then ruined Nixon, and then made and ruined him again. We saw the Republicans’ chances of electoral success in 2012 vanish in real time at the GOP conference as Clint Eastwood decided to go off-script and do X-rated versions of his Bob Newhart and Jimmy Stewart impressions. There are other world and universe-changing events witnessed on live TV I should mention – like 9/11 and the Moon landings – but…dude was talking to a chair! There’s no greater potential for surprise, shock and error in television than in a live broadcast, and that unpredictability carries a nervous energy that is utterly exhilarating. And we get it uncensored and first-hand. I’m reminding myself of what live TV is capable of because, if the past week is anything to go by, American TV has forgotten. Last Monday morning, news anchors on the local Los Angeles TV station KTLA breakfast show reacted to a mid-size earthquake that happened live-on-air by panicking, shouting ‘Earthquake!’ and diving under a desk until it had subsided. Now, I’m not going to pretend that I would have done anything different in this situation, even if I had been trained to keep going. But is there any point continuing to broadcast live if all we’re going to get is dead air, an empty studio and the terrified ramblings of presenters so shaken up by the event they can offer no meaningful information about it? Anchors on the other affected TV stations may have stayed calmer, but they didn’t do much better reporting the earthquake. Deprived of information, hindsight and proportion, presenters on Fox 5 and CBS 2 were left with the remnants of a child’s vocabulary. It was ‘big’. It was ‘large’. Some over-achiever even called it ‘strong’. They might have learned something about the conditions that Fox News anchors work under every day, but we learnt nothing. If you wanted to watch the television equivalent of muscle-wastage, then you needn’t have looked further than what CNN put on in relation to the search for missing Malaysian Airlines flight MH370 last week. Either the ‘Breaking News’ button was being used as a coaster for an unwanted drink for the past week, or the network genuinely thought the FBI acquisition of a flight simulator recording from the pilot’s home was some kind of crucial development in the story. Cue hours and hours of wild speculation about the significance of the simulator’s data, even after repeated protestation from the featured experts that conjectures about the pilot’s role in the hi-jacking could be argued any which way. It took former Boeing engineer Bill Nye the Science Guy, who is used to breaking things down for people with the minds of children, to tell us that the only thing we all could do was to guess. At one point, a pilot sat in a flight simulator and took viewers step-by-step through a scenario that he had entirely invented in his head. Not even the ‘Screen of Souls’ had an answer to free them from their suspended animations in a video monitor bank. 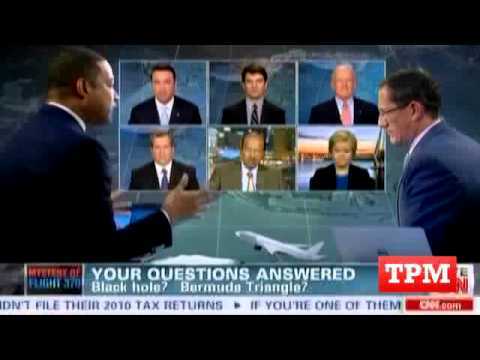 CNN imprisons aviation experts in screen bank until flight is found. Maybe the problem is that news reporting has too big a burden of information for continuous live coverage to carry. If so, then putting on a 2-hour entertainment programme that’s been on TV for years live should be a doddle, right? Well, not if it’s Dancing with the Stars. ABC’s primetime dance competition returned for a new season last Monday night with a re-booted format. But it was the basics of live television that the show tripped up on. The studio audience couldn’t be subdued for long enough to hear the judges’ notes on the dances. New co-host Erin Andrews comes from live stadium sportscasting and you would expect her to be adept handling live TV in the presence of spectators, but she kept overrunning, miscuing and recoiling from the audience’s spontaneous reactions. When live TV runs up against the clock and threatens to fall apart, we get a certain thrill as viewers. But it’s a fine line that if overstepped results in sheer incomprehensibility. It’s one of the qualities that makes TV so much more special than other forms of entertainment; yet live broadcasting in America is languishing. Abused, misused, and squandered, live TV barely deserves the name anymore. Last week I was in Mexico and then I came back and got a little sick (and then I rode the cups again…). My body only started to resemble a burst gravy dam on Friday, the day after returning, but now I’m starting to think that I was in some sort of hallucinogenic fever state the night before because I could’ve sworn I saw Hollywood actor-director Clint Eastwood hold a conversation with a chair while an audience of magenta elephants cheered him on. This was supposed to be a blog about sitcoms but, hell, Thursday night at the Republic National Convention was supposed to be about Mitt Romney! So as live television scuppers the plans-and we can only hope the dreams-of a national political party, it also forces me to reconsider what to write about this week. The delays of being a human colander and a holiday weekend has meant that I’m getting to Eastwood’s RNC speech long after it passed seamlessly into the zeitgeist and changed our everyday language, so that words like ‘chair’ now have new dictionary definitions such as ‘surrogate for American Presidents who are the subject of a race hate campaign by lying idiots’. So I’m only really going to be adding to what’s already been said. Firstly, I don’t hold with the rationale espoused by many commentators that the 82-year old Eastwood’s display was a by-product of an emergent senility. This man stars in, produces and directs an average of 3 movies a year, none of which look easy to make or star Adam Sandler. He still has his wits about him. Secondly, I’m not sure the performance was as leftfield or bizarre as some newscasters have made out. In the same way you can detect the John Ford and Sergio Leone influence in his many superb westerns, it’s easy to see what Clint was going for on the night. The delivery was reminiscent of the bashful stutter-shtick of James Stewart-an actor who held a few extreme views of his own-and the one-sided dialogue with the chair a homage to the actor’s performance alongside an imaginary rabbit in the classic comedy Harvey. There’s more than a touch of Bob Newhart’s try-and-guess-the-other-side conversation sketches in the way Clint’s responses to Banquo Obama would imply the absurd statements made by the unheard speaker, and cover for potential obscenities. No-one who’d seen any of the coverage from this convention could possibly be surprised at the vindictive and guttural tone of Clint’s personal attacks on Obama or felt any discontinuity between Eastwood’s portrayal of the President as a lowdown despot with the vocabulary of an Exorcist-child and the convention caricature of the Commander-in-Chief as a 21st Century black Capone running America as a racket with all the class of a divebar drunk. So why was Eastwood’s speech so remarkable and unusual? For my money, it’s because the debacle was shown live on TV. The Republicans had engineered their primetime line-up with Stalinesque precision; omitting delegates from the extreme wing of the party, bumping up the limited edition minority speakers to create a smokescreen of Republican diversity, and manufacturing (or more appropriately outsourcing) the image of Romney as a human male…largely by having his wife and five children attest to the existence of his sexual organs. The real-time collapse of this primetime-machine was a wonder to behold. As Eastwood entered against the video backdrop of a silhouetted still from The Outlaw Josey Wales which made Clint look like he has guns for fingers and what sounded like a Kenny G version of Ghost Riders, you’ll have never seen so many happy racists since the Rodney King tape went mail-order. Vice-presidential nominee Paul Ryan appeared to have tears in his eyes like a childhood hero was at his birthday party. Within minutes of Eastwood’s live-TV re-make of Fight Club starting, Ryan looked like he’d stumbled upon Eastwood trying to make out with his mother in the kitchen while Clyde the Orang-utan ate his birthday cake. Only live TV can do that. What’s more, for a party intent on editing and re-writing the history the last 12 years of American politics, this was one event that could not be manipulated, because it was seen by millions all at the same time without stops. Eastwood gave an unspinnable speech and the Republicans just had to grin and bear it. And grin they did, and whoop, and egg. They too cannot now pretend they did not enjoy Clint’s despicable behaviour. We all saw you!